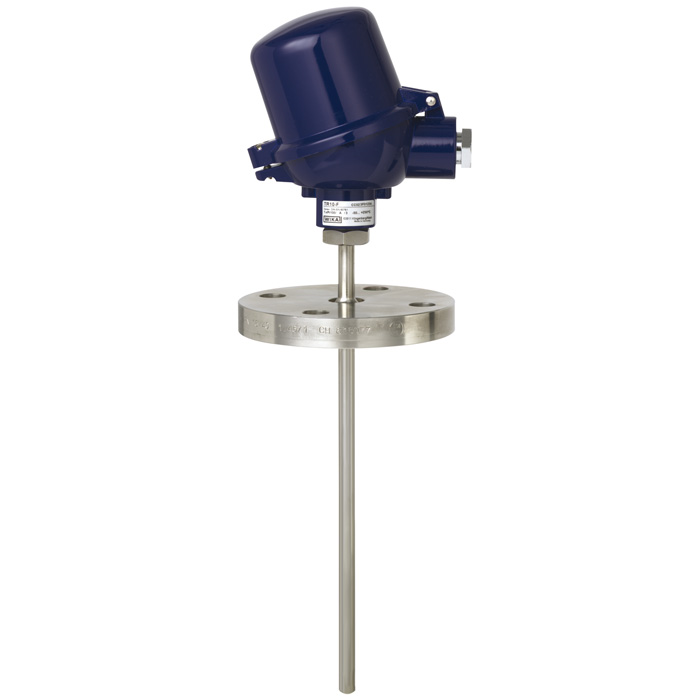 Resistance thermometers of this series are designed for fitting into vessels and pipelines. Standard flanges to DIN EN or ASME are available. These temperature sensors are suitable for liquid and gaseous media under moderate mechanical load. The protection tube is all welded and screwed into the connection head. Stainless steel protection tubes are suitable for normal chemical conditions. Coating is recommended as an optional extra with chemically aggressive media, or solid wear-resistant coating for abrasive media. The interchangeable measuring insert can be removed without taking out the complete sensor from the plant. This enables inspection, measuring equipment monitoring or, when servicing is necessary, replacement while the plant is running. The choice of standard lengths assists with short delivery times and the possibility of stocking spare parts. Insertion length, flange size, protection tube design, connection head and sensor can each be selected to suit the respective application. Optionally we can fit analogue or digital transmitters from the WIKA range into the connection head of the TR10-F.